The ECC works in partnership with ETSI to ensure new radio equipment entering the market uses the spectrum efficiently. This page provides information on the various ways in which ETSI (European Telecommunications Standards Institute) and the ECC work together. The ECC develops regulations for the effective use and Europe-wide harmonization of the radio frequency spectrum, and the efficient use of satellite orbits and, therefore, provides for decisions regarding the allocation/designation of frequencies for radio communications services and applications within the CEPT countries, as well as for related requirements relevant to the use of spectrum by radio equipment. ETSI develops standards for radiocommunication systems and equipment. Radio standards, and in particular those under article 3.2 of the Radio Equipment Directive, contain various requirements which relate to the efficient use of the spectrum, including compatibility between different radio services. A Memorandum of Understanding (MoU) has been agreed between ETSI and the CEPT Electronic Communications Committee (ECC) to formalise our co-operation. The provisions of the ETSI-CEPT MoU are applied in the development of harmonised standards for radio equipment, as well as in relevant ECC deliverables. ECC and ETSI representatives meet at ECC-ETSI meetings on a yearly basis in order to a maintain a strong relationship between the two organizations, to discuss strategic issues and to report on the ongoing activities in each of the organizations. 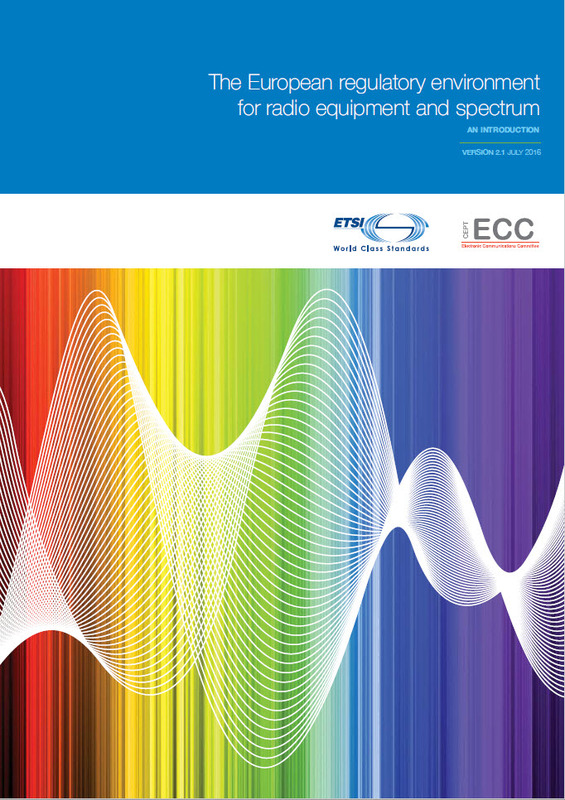 The ECC and the ETSI with support from the European Commission have jointly produced a brochure which provides an introduction to the regulatory environment in Europe for radio equipment and spectrum and some key information for newcomers. The initial version of the brochure has been published in April 2011. The brochure has been revised in 2016 in order to reflect the update of the relevant European regulatory framework. The latest version (November 2017) includes additional minor update. The ECC and ETSI maintain a relationship matrix (latest update 3 October 2018), reflecting the work and information connections between groups within both organisations. It shows whether there is an ongoing cooperation or a potential relation between ECC and ETSI groups. The matrix is updated 2 or 3 times per year, subject to requirements. The spreadsheet (last update on 29 June 2018) shows the list of ETSI Harmonised Standards (covering article 3.2 of the Radio Equipment Directive) under development or revision and their relation to the ECC deliverables or ongoing ECC activities. It is being developed within the framework of ECC-ETSI cooperation. Its purpose is to inform the ECC participants of the ETSI activities towards the development of Harmonised Standards and to support the consistency between ETSI HSs and related ECC deliverables. 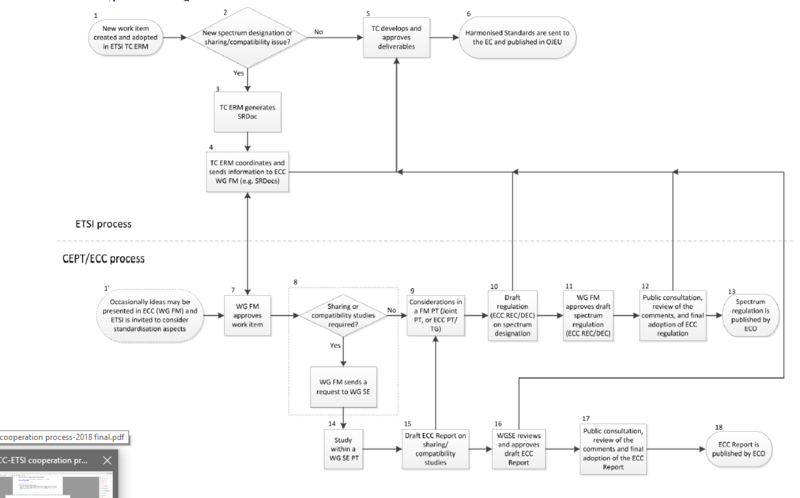 This SRDoc mapping spreadsheet (latest version: February 2019) provides a mapping of ETSI SRDocs (published and drafts) and the resulting ECC activities (mainly work items from the ECC Work Programme Database and then, once approved, corresponding Deliverables in the ECO Documentation Database). The document is describing the cooperation process between ECC and ETSI and has been developed in the framework of the ECC-ETSI Officials meeting. The latest update of the document has been published in June 2018. The ETSI work programme is available here. ETSI introduced a guidance document to facilitate the usage of their work programme database. ETSI organises regular event through the year. Click on the image on the right, to have access to the ETSI calendar of events.